The sciatic nerve is the largest nerve in the body. Distally it branches medially to the Tibial Nerve and laterally to the Common Peroneal Nerve. It is formed from the ventral rami of the fourth lumbar to third sacral spinal nerves and is a continuation of the upper part of the sacral plexus. It leaves the Pelvis through the greater sciatic foramen, inferior to the Piriformis muscle, and descends between the greater trochanter of the Femur and the ischial tuberosity. Initially deep to piriformis, it runs inferiorly and laterally posterior to the ischium, crossing over the nerve to Quadratus Femoris. Below the piriformis it lies deep to Gluteus Maximus. It passes inferiorly crossing Obturator Internus, the Gemelli and quadratus femoris. The Posterior Cutaneous Nerve of Thigh and the Inferior Gluteal Artery lie on its medial side. Descending vertically, it enters the thigh at the lower border of gluteus maximus, where it lies on the posterior surface of Adductor Magnus. Nerves branch off to the hamstring muscles. The nerve is crossed obliquely on its superficial aspect by the long head of Biceps Femoris. The nerve ends at the upper aspect of the popliteal fossa where it branches to distal nerves. The nerve can be represented on the back of the thigh by a line drawn from just medial to the midpoint of the line from the ischial tuberosity to the apex of greater trochanter down to the apex of popliteal fossa. 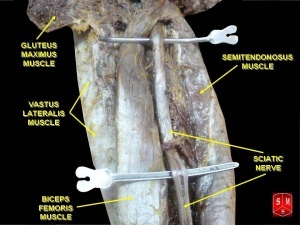 It supplies articular branches to the hip joint, with muscular branches to biceps femoris, Semitendinosus and Semimembranosus and the ischial head of adductor magnus. The nerve to the short head of biceps is from the common peroneal division, with the other muscular branches emerging from the tibial division. Indirectly innervates (via common peroneal and tibial nerves) the muscles of the leg and foot. Indirectly innervates (via common peroneal and tibial nerves) the skin of the lateral leg, heel, and both the dorsal and plantar surfaces of the foot. Youngman described 'Piriformis Syndrome' in 1928 as compression of the sciatic nerve by the piriformis muscle. This is associated with acute trauma to the buttock and occurs when the sciatic nerve exits posterior to the piriformis. The patient's may report that sitting and activities that require hip flexion or internal rotation as aggravate the pain. The pain radiates in a sciatic nerve distribution. Objective examination reveals tenderness directly over the piriformis or in the gluteal area, and the pain can be replicated by internal rotation of the extended thigh. This finding is called the 'Pace's sign'. There is sometimes weak abduction or external rotation against resistance. The pain may also be reproduced by rectal or vaginal examination. Initial medical management is oral anti-inflammatory medication. Steroid injection and surgical exploration may be considered for chronic cases. This pathology commonly affects athletes who present with localised and radiating pain near the ischial tuberosity. The pathophysiology is thought to be that of an insertional tendopathy at the ischium but there may also be involvement of sciatic nerve compression. The pain in hamstring syndrome radiates down the posterior thigh or popliteal region and is exacerbated when the hamstrings are on tension. This is often seen in sprinters or hurdlers. On examination there is exquisite tenderness over the ischial tuberosity and percussion in that region may reproduce the sciatic distribution of pain. Treatment involves rest, anti-inflammatory agents and steroid injections. Hip dislocations are most commonly associated high-energy trauma and therefore are often associated with multi-system injuries. It is important to examine for sciatic nerve injuries. The common peroneal division of the sciatic nerve is most commonly involved. Care is needed durring assessment as a femoral fracture can mask otherwise obvious hip dislocation. 'Kocher-Langenbeck' approach is the standard posterior approach to the hip joint. Performed in a lateral decubitous position without use of a traction table. To access the sciatic nerve the gluteus maximus muscle is split, where the nerve can be identified and examined. After identifying the sciatic nerve, the tendinous insertions of the piriformis muscle and the obturator internus are identified. When surgeons perform capsulotomies they take care not to injure the acetabulum labrum. The joint can then be assessed, any fracture fragments removed or stabilized and the entire area thoroughly washed out. The anterior approach to the hip for injuries can be performed through the 'Smith Peterson' or 'Watson Jones' approaches. These can be performed with the patient in the semi-lateral or lateral dicubitous position. One line descends vertically from the highest point on the iliac crest. The other horizontal line passes through the vertical line half way between the highest point on the iliac crest and ischial tuberosity. The sciatic nerve passes through the lower medial quadrant. To avoid damaging the sciatic nerve therefore, intramuscular injections are given only in the upper lateral quadrant of the gluteal region. Range of movement in the symptomatic limb is different from that of the contralateral limb. Sensitizing and desensitizing movements are essential to rule out any other structures that could be implicated as a source for a patient's pain. When assessing the sciatic nerve the hamstrings are also put on stretch during both tests. Once a position of pain reproduction is identified, dorisflexion or plantarflexion can be added which will increase and decrease symptoms respectively. Adding dorsiflexion increases the tension on the nerves because they form a continuous strucutre. The Straight Leg Raise Test (SLR) test is a neurodynamic test. Neurodynamic tests check the mechanical movement of the neurological tissues as well as their sensitivity to mechanical stress or compression. These tests, along with relevant history and decreased range of motion, are considered by some to be the most important physical signs of disc herniation, regardless of the degree of disc injury. ↑ 3.0 3.1 Petty NJ, editor. Neuromusculoskeletal Examination and Assessment, A Handbook for Therapists, 4: Neuromusculoskeletal Examination and Assessment. Elsevier Health Sciences; 2011. ↑ David J. Magee;Orthopaedic Physical Assessment; Chapter 9-Lumbar Spine;Fifth Edition: Pg 558-564.